Medication Station by Carex is a convenient way to keep your medication organized and all in one place, divided up for two weeks' worth of portions for your daily regimen. With two Ultra Bubble-Loc Pill Organizers and the Ultra Splitter in a neat non-slip carrying tray, the Medication Station is a complete package to make your medication routine easier. The Medication Station features conveniently removable parts to make traveling with your medicine simple, as well as easy, straight-forward filling and cleaning. The patent-pending secure lids keep pills safely in place when in your suitcase, purse, or backpack, yet are easily opened with the simple push of the thumb. 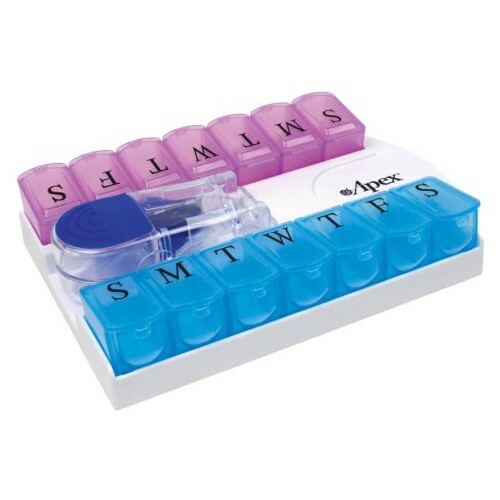 Vitality Medical also carries other Medication Organizers, such as the Aculife Lg 7 Day Pill Box. 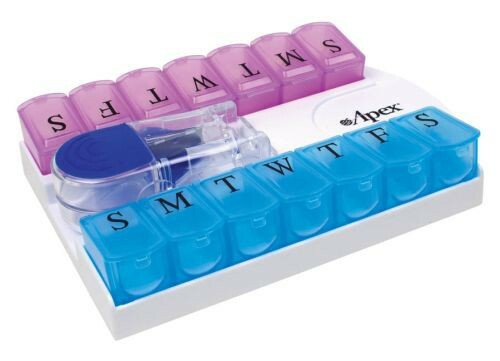 Includes: Ultra Pill Splitter, Two 7-Day Pill Boxes. Non-Slip Base Tray. Non-Slip Design and Secure Lids. Removable Parts For Travel, Easy Filling or Cleaning. Allows User to Keep All Medication Needs in One Place. Color: White Base, Blue and Berry 7-Day Ultra Bubble-Lok Pill Organizers, Clear Ultra Pill Splitter.